The 2018 – 2022 Strategic Plan Is Now Available. Please click here to access the plan. NOTE: The direct link to the PDF document of the plan (see the left column on this page) can be found → here. (April 15, 2019) — A Virginia coin collector is about to get his second windfall from finding one of the first, elusive West Point Mint 2019 Lowell National Historical Park quarter-dollars. Only two of those recently released 2019-W Lowell quarters have the distinctive Professional Coin Grading Service (www.PCGS.com) designation, PCGS First Discovery, and are the first 2019-W quarters certified by any third party grading service. Graded PCGS MS 66, the coin owned by the lucky Virginia collector has now been consigned to a public auction to be conducted by GreatCollections® (www.GreatCollections.com) and can be viewed at www.GreatCollections.com/coin/700841. The noteworthy coin is being sold with no reserve. Bidding started at $1 on the morning of April 15. Within six hours there were 35 bidders and it had reached $1,150. The online auction will end on Sunday, April 28, 2019. “It’s great to see the United States Mint thinking outside of the box to stimulate new collectors by introducing the first W mint mark on a circulating quarter-dollar,” said GreatCollections President Ian Russell. “The first coins have already caused a frenzy, with thousands of people around the U.S. searching through quarter rolls looking for W mint marks. Personally, I haven’t found one yet, but there is still time and I am determined to find one in change!” Russell stated. “PCGS offered a $5,000 reward to whoever submitted the first America the Beautiful series 2019-W Lowell quarter for authentication and grading. The submitter would get their coin certified by PCGS and returned along with a $5,000 bounty. Two qualifying coins arrived at our offices at almost the same time; this one from Virginia and another, now graded PCGS MS65, from Kansas. The submitters agreed to split the reward,” explained PCGS President Brett Charville. “Now the winning bidder in the GreatCollections auction will have the exciting opportunity to own one of the most historically significant coins of 21st century U.S. numismatics: an example of the very first circulating quarter-dollar with a West Point mint mark certified by any third-party grading service,” Charville stated. “Excitement should only grow as special find pedigrees from the 2019-W quarter releases will have registry set bonuses for their respective sets in the PCGS Set Registry program,” he added. Since its founding in 1986, PCGS experts have certified over 41 million coins with a total market value of over $33 billion. For information about PCGS products and services, including how to submit your coins for authentication and grading, visit www.PCGS.com or call PCGS Customer Service at 800-447-8848. GreatCollections of Irvine, California is an auction house for certified coins and paper money, as well as coins approved by CAC. Sales have exceeded $30 million over the past 12 months. For additional information, contact GreatCollections by phone at 949-679-4180 or by email at info@GreatCollections.com. 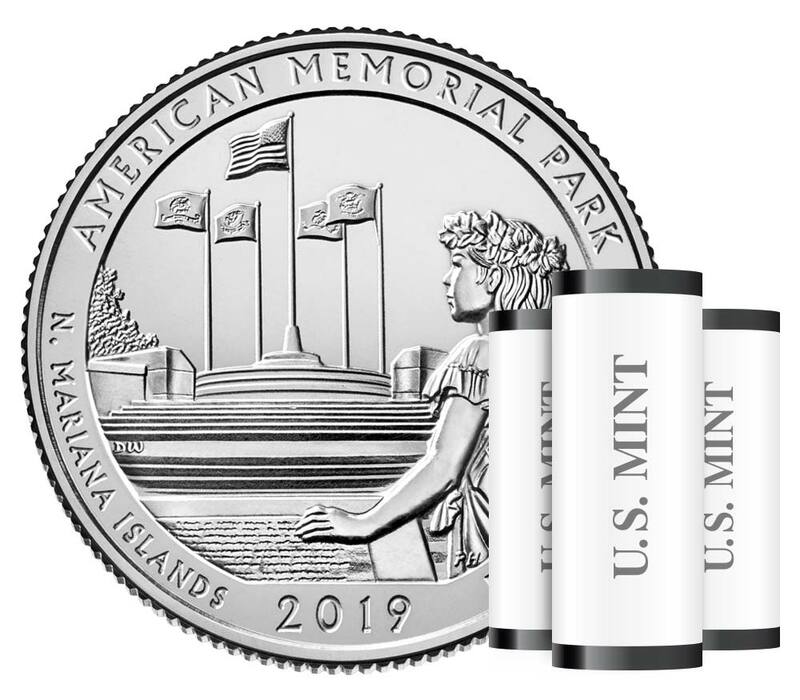 WASHINGTON – The United States Mint (Mint) is now accepting orders for products featuring the America the Beautiful Quarters® Program coin honoring American Memorial Park in the Commonwealth of the Northern Mariana Islands. The Mint produces the coins in the rolls and bags at the Philadelphia, Denver, and San Francisco facilities. The three-roll set contains coins from all three facilities. Unlike the “P” and “D” mint mark quarters, those with the “S” mint mark will not be released into circulation. The Mint accepts orders at www.catalog.usmint.gov and at 1-800-USA-MINT (872-6468). Hearing- and speech-impaired customers with TTY equipment may order at 1-888-321-MINT. Shipping options are available at www.catalog.usmint.gov/customerservice/shipping.html. April 12, 2019 – Two avid coin collectors, one in Kansas and the other in Virginia, have agreed to split the $5,000 bounty offered by Professional Coin Grading Service (www.PCGS.com) for almost simultaneously submitting the first 2019 “America the Beautiful” Lowell National Historical Park quarter-dollars with a West Point mint mark. Both submissions arrived on the same day at PCGS headquarters. But the PCGS Quarter Quest has not ended, and there are still opportunities for rewards and fun with W mint mark quarters in the weeks ahead. It didn’t take long for the questions to be answered. The first two qualifying W mint mark quarters arrived at PCGS on Tuesday, April 9. One was submitted by a collector identified as “Steven R.” from Topeka, Kansas, the other was submitted by collector “Michael T.” of Fairfax, Virginia. 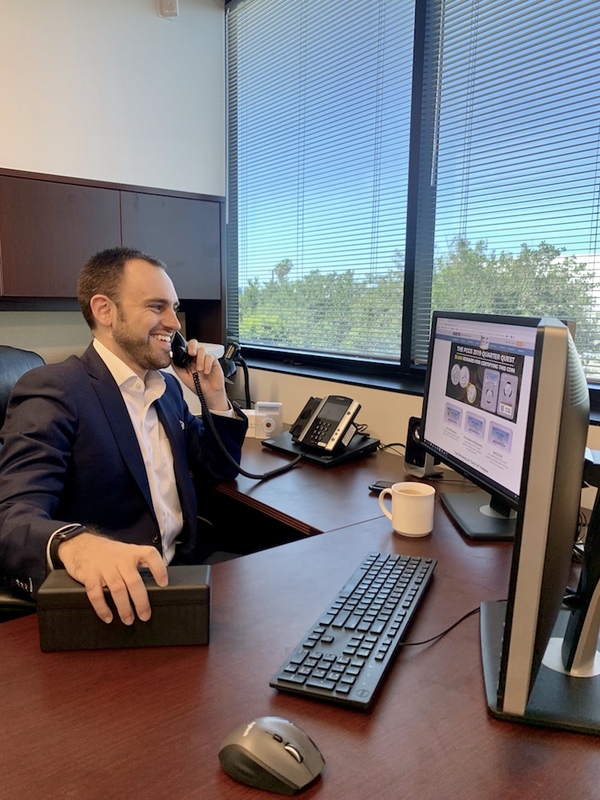 Steven told PCGS he obtained his winning coin, now graded PCGS MS65, when he “just stopped at a gas station to buy a couple of Pepsis.” His interest in coin collecting started from searching through his grandfather’s coin jars hoping to stumble upon something big. “I was always looking for that ‘44 steel penny,” he explained. Michael, who began collecting as a youngster when his father gave him an Eisenhower dollar, revealed he found his winning coin when he purchased rolls of quarters. “On the end of one roll I saw a W mint mark, and I was super excited there might be something good in here,” he recalled. His W quarter is graded PCGS MS66. The PCGS Quarter Quest competition will continue giving collectors an on-going chance to win a reward for finding some future W mint mark quarters. “We are offering a bounty for each of the remaining and qualifying 2019 America the Beautiful West Point quarters,” explained PCGS Director of Marketing Heather Boyd. “The bounty for the first submitted Northern Mariana Islands’ American Memorial Park 2019-W, anticipated to be the next put into circulation, has been set at $2,000. 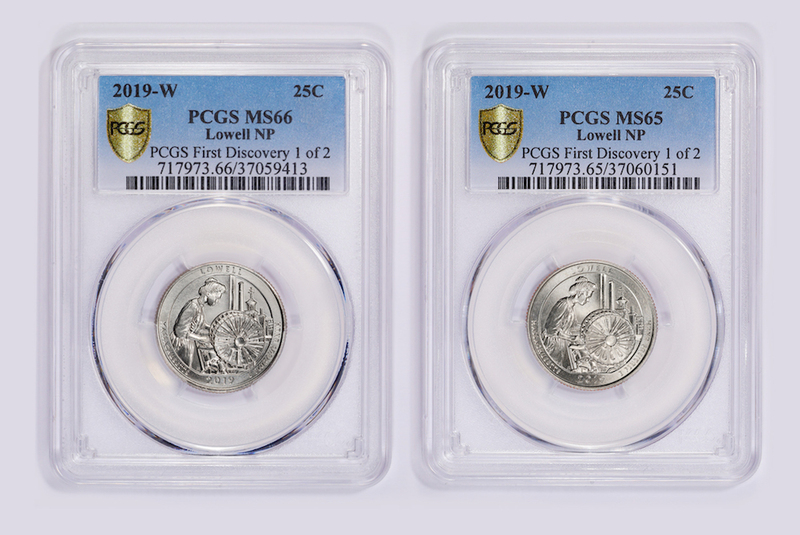 As with the Lowell quarter, any submitted within the first seven days after the PCGS First Discovery has been confirmed will automatically receive the First Week of Discovery pedigree,” she said. 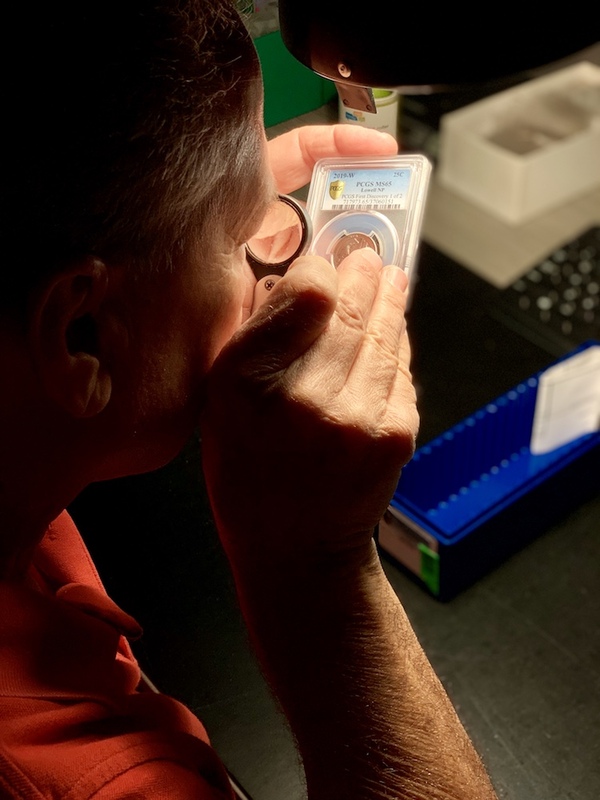 The qualifying coins submitted after those 7 days and within 45 days of the PCGS First Discovery will automatically receive an Early Find pedigree. PCGS has created an information page for the promotion at www.PCGS.com/2019quarterquest where coin hunters can check on updated bounties, see if a PCGS First Discovery has been graded and authenticated, and review the terms and conditions for the promotion. For information about PCGS products and services, including how to submit your coins for authentication and grading, visit www.PCGS.com or call PCGS Customer Service at (800) 447-8848. American Numismatic Association (ANA) members are encouraged to share their ideas and research with fellow hobbyists by delivering a Money Talks presentation at the 2019 World’s Fair of Money® in Chicago, Aug. 13-17 at the Donald E. Stephens Convention Center. Money Talks presentations should be accompanied with digital images. Speakers should arrive 15 minutes prior to their presentation to set-up. Contact Sam Gelberd, the ANA’s numismatic educator, at (719) 482-9846 for additional information. The World’s Fair of Money is one of the largest, most educational coin shows in the country and features nearly a thousand numismatic dealers with extensive inventories. The show includes a wide range of technical seminars and educational presentations; an exhibits area; major auctions by Heritage Auctions and Stack’s Bowers Galleries; and the ANA Museum Showcase, exhibiting some of the world’s most rare and valuable coins and paper money. For more information, visit www.worldsfairofmoney.com. The American Numismatic Association is a congressionally chartered nonprofit educational organization dedicated to encouraging people to study and collect coins and related items. The ANA helps its 25,000 members and the public discover and explore the world of money through its vast array of education an, outreach programs, as well as its museum, library, publications, conventions and seminars. For more information, call (719) 632-2646 or go to www.money.org.